My first website was built using Frontpage. Then I discovered Geocities, which at the time made it easy to break and fix code and have it instantly live for others to find on the world wide web. It was an optimal learning environment for me. I learned HTML and CSS by copying, pasting, and then tweaking every which way until it was doing something absurd like flashing hot pink text. It was the Wild West and there were no real rules yet except for those in this new language. Like any language, I was learning little by little in search of ways to bend the rules and “speak” like a native. I only coded for fun, but many years later, I made a website for a job. I used Dreamweaver because I was told all professionals used Dreamweaver. I found it easy to use, much easier than Frontpage, especially for building a larger more complex website. I started learning how to read PHP and doing a lot of what was needed in the metadata and the code for basic SEO. Fast forward another few years. I set up several free sites for nonprofits using Webs, Weebly, other page builders whose names I can’t recall, Joomla, and then, one day I stumbled upon WordPress. I wasn’t sure if I liked it at first because the out of the box theme was ugly and I couldn’t figure out how to manipulate it. Then, I found a theme on Themeforest that installed the styles and the demo content. This was worth the $30. This gave me the ability to tweak the theme because I knew enough HTML and CSS to change things in the file editor. I was still coding like I did in my Geocities days, only my aesthetics had improved. I cringe relaying that experience now. I knew enough to be really dangerous. I didn’t do any form of version control, I didn’t do any backups, I didn’t vet my plugins, or even know how to properly vet my plugins. I am so lucky nothing went terribly wrong. On one hand, WordPress gave me an easy way to dive right in and do everything on my own. On the other hand, it made it too easy for me to download bad plugins, edit things I probably should not have been touching, and in the end, I guess that’s okay because when I was serious about maintaining a website, I did take the time to learn more about what I needed to know. What I know today is that I am not a developer. I’m not even a designer. I have fun with the creation process, but there are other people who are much more talented and efficient in those processes and I’m happy to pay them for their expertise. I have learned what I need to know about the framework and can talk to designer and developers about what I’m looking for and to ensure they know what they’re doing. I can pick out reliable themes and plugins. I can advise our clients who are mostly nonprofits and social enterprises on the best path for a sustainable website. I understand the needs for disaster recovery, backups, and security. I understand the value of paid premium licenses and ongoing support. These are all things that in my days of starting out I didn’t know I needed. Even if someone tried to explain it to me, I probably wouldn’t have felt that I needed them. Sometimes I can be stubborn and I need to experience the pain points myself before I buy into what everyone else is saying. I used to learn best from failure. I still learn from failure, but when it comes to WordPress, I have also surrounded myself with a community who help me grow and learn. In 2013, I started attending the Fort Worth WordPress meetup. The group was still pretty small at the time, but they were very inviting. I picked up some new tips and tricks that I used right away. While my eyes glazed over at some of the more advanced details, I understood the possibilities and that the work was beyond my capabilities. I learned how to ask for help with those things. Remember, I’m not a designer or a developer, so this meant hiring those for those skills from the network of people I met in the WordPress community. Over the last 4 ½ years I’ve been able to sell numerous WordPress projects and some of them are incredibly custom and complex. In return, I’ve been able to provide freelance work for members of my community, I’ve been able to give back via WordCamps sharing my experience with project scoping, sales, and negotiations. We all have something of value to share. No matter your area of expertise, you can give something back to the community. The best thing about WordPress is not the tool itself. It’s the people who use it or are wanting to try it. The WordPress community is what makes WordPress and WordCamps really great. My hope is that as a community we can help WordPress evolve and adapt and that we can leverage technology, including WordPress, for the greater good. We’ve already done this and that’s why WordPress powers almost 30% of the web. We’ve been doing it for years, but the technology landscape is changing rapidly. Are we keeping up? A few weeks ago, Chris Lema asked me and a group of other WordPressers, “What could destroy WordPress, and how would you fix it?” We answered this a number of ways and you’ve probably come up with your own answer. My answer? I think that the evolution of technology could destroy WordPress. To fix that we would need to evolve, dream big, and create the innovative changes that would keep WordPress alive. We can’t wait until the changes are already in place. It would take far too long for such a large ecosystem to catch up, and in the meantime, it would start to disappear. Look at Kodak; my kids don’t even know what a Kodak moment is. That’s just sad. What is our dream as a community? Will people talk about WordPress in the past tense or will we find ways to help it thrive? Even as we work towards the same dream, there are still complex challenges to overcome. We’ll likely fail many times as we try to innovate. This is actually good; we’ll learn from those mistakes, but we might become jaded. We’ll certainly have moments of frustration. We might even try another framework, and the grass might actually be greener on the other side. Yet, the fact that we are such a close knit community sets us apart. Imagine what could happen if a community this large banded together towards one dream. We could pave a path towards something really great. It feels like a huge undertaking. It’s something that could paralyze us if we tried to get it “right” before we started. The key is to set common goals, but to individually start working and living on purpose. Then, we can come together in a more meaningful way. In my recent keynote at WordCamp DFW I shared a bit of my heritage and my life story so that people could understand my passion for social impact. Everyone has a story that makes them unique fit to tackle different challenges. When we put our collective skills together, we can make a difference. Many paths have been paved so that we could live in a different world. Now, our dreams pave the way for future. 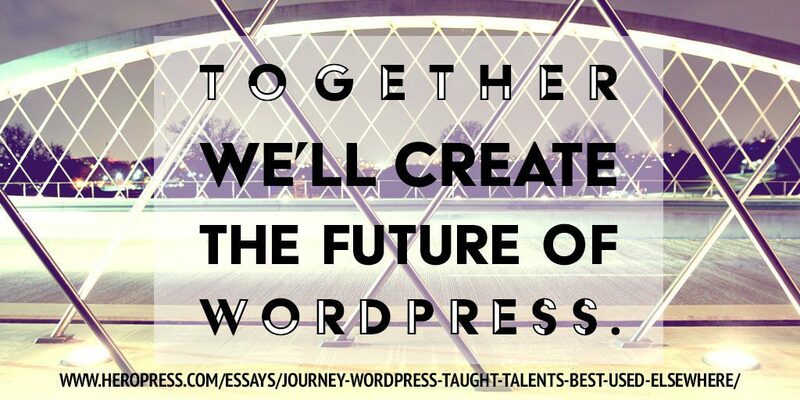 Together we’ll create the future of WordPress. The post My journey to WordPress taught me that talents are best used elsewhere. appeared first on HeroPress.